The competencies assessment tool (link here) is one of the fundamental resources for your SEC as it engages in the program. You will notice that there are seven sections. Most of these correspond to a technical mentorship. When you complete the assessment at the start of the program, you will see where your SEC has weaker points, and where it will benefit from mentor support by way of seminars, up-skilling and training workshops. In years two and three, you will repeat the assessment to see how much your SEC has advanced in its competencies and where it needs more support. By the end of the third year, the aim is for your SEC to have an even spread of skills and connections across the competencies. Integrated Planning – This is about establishing goals and mapping out realistically how you can achieve them (your regional mentors and the SEAI are key to helping you devise these). Energy Efficiency – It is essential that your SEC measures energy use in your community. Your EMP will help you achieve this. By year 2, you should be able to show that your competency in this area has increased and preferably you have participated in the energy efficiency programmes. Renewable Energy – There are a range of energy generation technologies which your community may be interested in devising projects for. It is not essential for the SEC programme, but you should gain as much information about the opportunities as you can and share this information within you community. 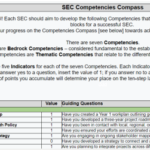 As with the stakeholder map, the SEC should draw on as many members of the committee/steering group as possible when completing the competencies spreadsheet. You may not be aware of all the skills and experiences your colleagues may have. It may be useful for you to gather together with your mentor in a Skype call and complete the competencies spreadsheet as an addendum to a committee meeting.